The recent political changes which have occurred across North Africa and in the Arab world result from a variety of factors, but most relevant is the fact that the vast majority of the world’s population has been systematically locked out of a profitable economic system by Byzantine legal procedures and political repression. 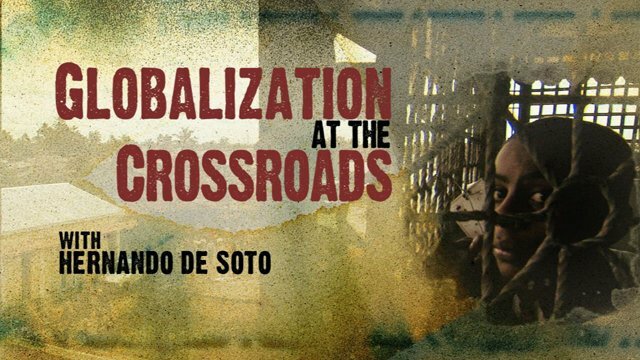 Globalization At The Crossroads features renowned Peruvian economist and author, Hernando de Soto, whose twenty years of research indicate that only in places where there is widespread personal property ownership--coupled with inclusive, efficient, and transparent business and property law—do economies prosper. This program demonstrates how the West successfully revolutionized its legal systems, property laws, and developed the modern corporation. Other nations that have instituted private property and business reforms, such as post-WWII Japan and present day China, have seen their economies take off and their middle classes grow. Globalization At The Crossroads explores the legal and social revolution in Albania, China, Japan, Switzerland, Tanzania and the United States, and concludes that unless we include the 80% of humanity currently excluded from the economic system, they will bring the civilization down, as they have brought down other civilizations in the past. Globalization is the new civilization.